Whether the PBC is a race, a personal fitness challenge, or some combination will be debated. Not debated is what happens when you get to the top. It's an awesome social event made sweeter by where you are , what you just did, and who you're with. The bond among participants transcends age and ability, For some the bond starts well before they arrive . Families and friends have connected at the Challenge since the beginning. They'll tell you it makes the experience even better. One group is spread across Oregon and the PBC is their annual reunion. When they thought the race had ended in 2014, they just created their own PBC. They had plans, rules, and even a fee until they heard it was back on. Those skilled at social media are way ahead of us. We want to see how you bring people you know into the PBC and we're giving away prizes. See how many others you can bring in. Then tell The Butte Lady what you did and how it went. Next year you may be highlighted as one of many success stories. If we choose your story, you'll win a prize. How cool is that? We think most strategies will involve tagging but who really knows? Creativity has no limits. ﻿Carol Smith (aka, The Butte Lady) has been inviting city officials to Butte events for three years. 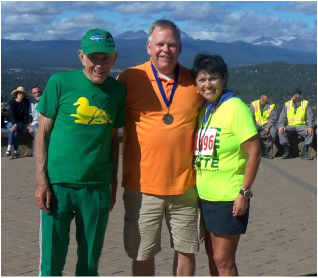 Here she is with Bend Police Chief Jim Porter on top at the 2015 Pilot Butte Challenge. She'll try a tagging strategy this year to see who she can get to either race or be a VIP spectator. You can follow along by clicking the button below. 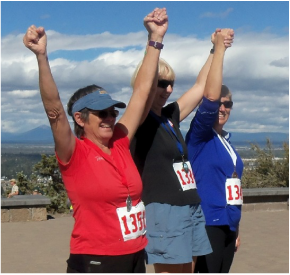 Not that it's a competition but so many of you can do outdo the Butte Lady. She'll admit she isn't all that skilled on Facebook. As soon as someone tops her, the story goes right here. When the top two bump her off this page, they win prizes that Carol will happily present at the PBC. It's always all about the Butte for her.